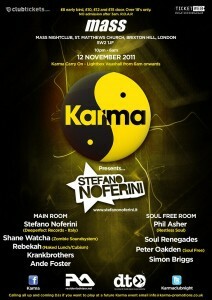 Win VIP tickets to Karma launch night. You are here: Home / competitions / Win VIP tickets to Karma launch night. A new night launches on the 12th November at Mass, Karma, which promises driving house and jacking beats. Headlining and flying in from Italy none other than top Italian DJ and producer Stefano Noferini. Noferini has played the world’s best clubs, hosts a radio show heard across the world, and has many house music hits under his belt – at least one of which you are likely to have gotten down to at some point last year as they are played by everyone from from Paul Van Dyk to Richie Hawtin, and from Carl Cox to David Guetta. Backing him up with deep and tech sounds all night long will be one of London’s busiest DJs Shane Watcha, among the current trend of dj’s coming out of London, Shane is a rare Breed. He has crafted a sound that is uniquely his own and distinguishes him from the rest of the pack. It’s all delivered in a supremely tight mix that flows with emotion & a passion that runs deep. Alongside him is the beautiful and talented Rebekah, London’s warehouse party organisers extraordinaire Krankbrothers and DJ and promoter Ande Foster. In the Soul Free Room new kid on the block Peter Oakden has brought together the finest deep and soulful DJs for a night of pure eargasm. Between them Phil Asher, Ricky Reid and Craig Smith have years of experience in this game and you will be treated to some of the freshest deep house they have to offer. Plain and Simple have not one but three pairs of VIP tickets to give away to this event. To enter simply tell us: What is Shane Watcha’s record label called? Closing date for entries is the 10th November. Send your entries to jo@plainandsimple.tv and remember to include your contact details. Mass, Brixton, Saturday 12TH November. WIN TICKETS TO FIELD DAY!!! Get ready for a TON of brilliant prizes in our crazy spring giveaway!